Doctor Who "Journey to the Centre of the Tardis" recap. Doctor Who “Journey to the Centre of the Tardis” recap. Wait wait wait there’s a history of the Time War?! In Slate’s Doctor Who TV Club, Mac Rogers discusses the Doctor’s travels via IM every week with the show’s bloggers and fans. This week he’s chatting about “Journey to the Centre of the TARDIS” with Andrew Blair, who writes for Den of Geek. Mac Rogers: So in a rare vulnerable moment in which the Doctor has disabled all the TARDIS’s defense systems, the time-ship is captured by a “magno-grab” ray from a nearby salvage ship run by the Van Baalens, a family of scrap merchants. Clara is trapped inside the badly damaged—possibly dying—TARDIS, so the Doctor tricks Gregor and Bram Van Baalen, and their supposedly “android” helper Tricky, into helping him find her. For me, “Journey to the Centre of the TARDIS” has so much going for it on the conceptual and production levels that it was extra-aggravating to me that the script by Stephen Thompson kept falling down on the job. Andrew Blair: It had a strong middle act, but a weaker beginning and ending. Scriptwise I felt like it needed to be less fan-servicing. Looked great though, can’t deny that. Mac: It did look great! I’ve read that Moffat wanted to redeem the poorly realized TARDIS interior of 1978’s “The Invasion of Time” (with its legendary Sontaran pool-chair debacle). In that sense, I think “Journey” is a success. I love the notion (echoed in “The Edge of Destruction” and “The Doctor’s Wife”) that when it’s injured, the TARDIS turns into something of a haunted house. Andrew: That was one of my favorite aspects. This series has essentially cast the TARDIS as a mute, truculent third wheel. Mac: The Van Baalen brothers are where my annoyances started. Why does the Doctor think they can help him? And why, when they think they’re in a race against death, do Gregor and Bram waste time junking the TARDIS and openly defying the man who controls their fate? Andrew: The Doctor needs more people to cover more ground, and no one else is available. And someone else needs to be there to get killed. Mac: I liked the idea of the Van Baalen brothers—I feel like the Doctor doesn’t cross paths with blue-collar folks that often in the new series—and I liked the three actors as well, but I kept feeling like their presence was cluttering up what should have been an amazing two-hander—well actually, as you note, a three-hander between the Doctor, Clara, and the TARDIS. Especially in a season built around the idea that the Doctor and his companion trust each other less than usual, I feel like it’s a missed opportunity not to have a claustrophobic story studying their relationship. Thompson tried to make the brothers interesting, particularly with the Tricky reveal, but for me it felt like crammed-in backstory. Andrew: The brothers lacked nuance. Mac: It was a little ludicrous that Tricky would believe Gregor’s lie about being an android, but Jahvel Hall played it well, as a guy who takes comfort in believing the lie until it’s no longer possible. Andrew: He felt like a little brother, and the scene where he attacked Gregor was probably the best Van Baalen brothers scene. Especially Clara’s little glance downwards to avoid making eye contact with either of them. Mac: Jenna-Louise Coleman played that scene well, gently disengaging herself from the raw filial conflict playing out inches from her. I find her to be a wonderfully watchable actor (beyond just being super-attractive). Like Matt Smith, she’s always playing a moment slightly differently than you expect, and she goes through all these hairpin emotional turns. Andrew: She’s doing a lot with a strange role. What I find odd about Clara is that she isn’t asking more questions. She lets things go quite easily that feel, perhaps, more emotionally bothersome than something resolved by a hug. Mac: Yes! That moment bugged the crap out of me. She has to go from “I think I’m more scared of you than anything else on this TARDIS” to “I don’t understand what the hell this is about but the hug is really nice” way too fast. Coleman found a way to play it, but it’s really icky as written. It should’ve taken much longer for the Doctor to win her back after that. Of course we quickly learn that the Doctor, Clara, and the Van Baalen brothers aren’t alone on the TARDIS. I have to say, I thought the “burn-zombies” were the scariest monsters on Doctor Who in quite some time—scary in how they look and sound, how they were shot, in what they seemed to imply about the Doctor, and even still scary after we learn what they are. There was an extra level of being on your toes, not just from, “Uh-oh, scary monsters” but also: “Why are these monsters on the TARDIS? What is their presence teaching us about the Doctor?” As Clara says, “Good guys don’t have zombie creatures, basic storytelling!”) That Thompson kept that second question in the air as long as he did was my favorite element of the script. Andrew: They were visually brilliant. However: Why are they so angry? If they’re really Clara and the Van Baalen brothers from the future, burned by the Eye of Harmony, why are they now sizzling folk to death and generally acting all creepy and monstery? Mac: That sort of worked for me on a nightmare-logic level (not unlike the Primords from “Inferno”). Did you have a moment, when you found out that one of the burn-zombies was Clara but before they finished the explanation, of thinking the Doctor was somehow attempting to reanimate the Clara duplicates and failing? For a second I thought that’s what he was about to reveal and it gave me the shudders. Andrew: I didn’t, but I do like how the Doctor is very morally dubious in this series. Smith’s Doctor is now a lot more like a deranged child—like Joffrey crossed with Willy Wonka. He’s very driven, and it makes him unpredictable and very alien. I’m loving it. Mac: I loved the Architectural Reconfiguration System, a tree of living metal that builds the machines the TARDIS needs. And there was a fun bit of making running through the same corridors over and over again a creepy feature rather than a money-saving bug. And we got a look at the swimming pool! Andrew: We also got a few tantalizing sound clips from the show’s past, a bit of Pertwee and Jo Grant, some Eccleston in there, and Time Lord voices from the liquid encyclopedia that I may have tried listening to about four times. Mac: Oh—we haven’t talked about the Eye of Harmony. 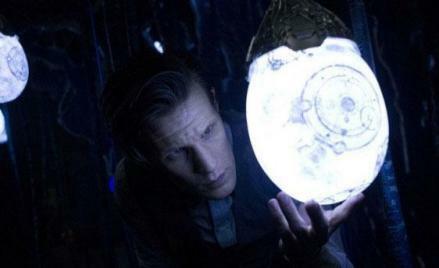 So they’ve fully embraced the TV movie idea that the Eye is now in the TARDIS—or maybe that a portion or mini-version of it always was? Apparently there’s a number of fan explanations for how the Eye could be both on Gallifrey and in the TARDIS. Wikipedia refers to these as “fanon,” a word I’m both delighted and appalled to know exists. Mac: One bit of praise for Thompson’s script: I felt like he had some fun with the magic-button-that-will-solve-everything while also playing fair with the story-mechanics of it, with the magno-grab being introduced in the first ten minutes. But I hope next year they try to brainstorm a few more endings that involve the Doctor doing clever things, not taking advantage of time paradoxes or inspiring people to be their best selves all the time. Although in “Journey” the TARDIS wasn’t exactly being her best self. Why is she so unhelpful to the Doctor? Doesn’t that contradict the Doctor-friendly persona we met just last year in “The Doctor’s Wife”? Andrew: Because it’s had bits of it removed, the TARDIS is in a huff and doesn’t want anyone to get at her engine room. It does, presumably, allow the Doctor and Clara access to the console room from the engine room without going anywhere near the Eye of Harmony chamber where the Clara-Rock-Zombie thing is, so you could say it cheers up a bit once it knows the Doctor’s all right. 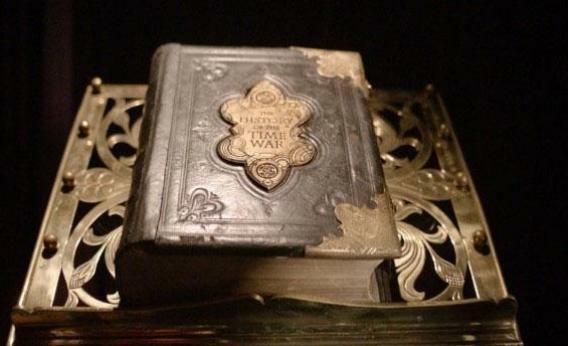 Mac: Let’s talk the huge geek-out moment: in the TARDIS library we see a “History of the Time War,” which appears to contain the Doctor’s real name! What do you make of that? Andrew: Who wrote that book? How do they know all the stuff that happened in the Time War? How is the Time War translatable to prose? How do they know the Doctor’s name? It’s either the Doctor or River Song. Really it has to be River, because I can’t see the Doctor writing a massive book about the most traumatic experience of his life and putting his real name in it. But then I don’t know if River’s that good an archaeologist, and you think she’d know better than to give her husband a massive book about the most traumatic experience of his life. And write his name in it. To summarize, that makes precisely zero sense.